Experience yoga while floating on the crystal clear waters of Honolulu, Hawaii. Standup paddleboard yoga is a unique adventure that combines the physical challenges of practicing yoga on a paddleboard with the majestic beauty of Hawaii’s oceans and shorelines. Classes available for all levels. Small group sizes ensure personalized attention from our highly qualified instructors, allowing each student to work at their own ability level. 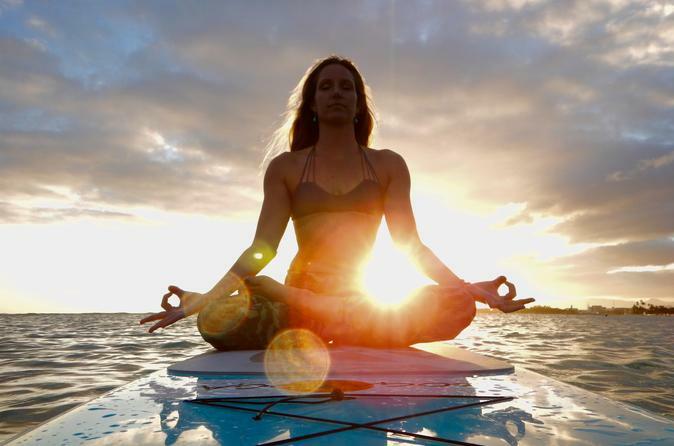 The SUP yoga classes include many familiar yoga poses adapted to the water. Most of the poses are done seated, kneeling, or lying down, with a few standing poses as well to work on balance and core stability. Free time is incorporated into each class, giving students a chance to try any poses they would like to work on. Classes end with traditional savasana, a meditation experienced lying on the board with the soft rocking of the oceans waves, fingers and toes trailing into the water, and the mind free to relax and let go. Classes start on the beach, where you will meet your instructor and sign in for class. The instructor will explain some basic paddleboard yoga principles, such as how to stay centered and balanced on the boards, adaptations for yoga poses on the water, and safety precautions. Once we are ready to enter the water, students will wade with their boards out to waist deep water where we drop an anchor. Students make their way onto the boards and start with a seated meditation, connecting with the breath and with nature. The first movements on the board are done seated and kneeling as we begin to warm up the body. Next we will make our way to standing and get a sense of balance on the boards. We will move through a few sun salutations as we build heat in the body and gain confidence moving on the boards. As we continue with class, we will work up to some balancing postures, learning how to adapt and modify the yoga practice to the water. Free time is incorporated into each class to give students a chance to play with any pose they want to try. This time is lighthearted and fun, and sometimes ends with a splash! As we begin to wrap up class, we bring the heart rate back down and get into some deep stretches. Classes end with savasana, a simple meditation done lying on the back. This blissful floating meditation allows both the body and mind to let go, relax, and be at peace.